The Earth 2 Mouth program is a community service opportunity that connects local food producers and soup kitchens in an end-to-end volunteer experience. Many local farms are short on labor. In exchange for 3-5 hours of work by a group of volunteers, farms give volunteers produce, which then can be written off on taxes as a donation to the food pantry or soup kitchen. Students and citizens alike are looking for volunteer opportunities, including those looking to fulfill service hours requirements. 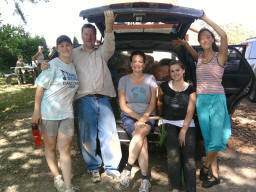 They get the experience of working in the fresh air on a farm and helping their neighbors where the need is greatest. Places that prepare and serve the poor are always in need of food and volunteers. This is the hands-on fulfillment of the days work, where people can actually serve others wholesome, fresh food they may have picked themselves. Recently, we piloted the program with volunteers from the Unitarian Universalist Church of Amherst, coordinated by Seminarian Michelle George. They worked at Native Offerings Farm, bringing and preparing the bounty to the clients of Friends of Night People in Allentown (Buffalo). We will be establishing a database of participating farms, volunteer groups, and places to serve the food to the poor. If you or your organization has any interest in participating in the program, please contact Ken Stuczynski at 716-868-1329 or ken [at] otherflock [dot] org. Next year’s program will be running from around May to September 2011, but planning early will make it a success.